which offers complete security solutions, consultancy, trained security with the application of the most advanced and innovative security technologies available in the industry. This is possible due to our expertise and continuous investment in R&D to ensure that we remain at the forefront of changes that continue to shape the future of our industry; as our goal is safeguarding lives and properties we have been entrusted with. These are persons trained through rigorous processes with an eye towards providing fool-proof physical security for their employers ranging from dignitaries to VIPs and PEPs. Strict background check, police and medical checks are carried out on them and are medically and physically fit. Our corporate guards are well-read, have received a tailored advanced security training and unarmed combat drill, guarantors are verified and are always at alert and watchful to detect security threats from in and outside the premises. Client’s safety is their paramount agenda. They are physically, medically fit. 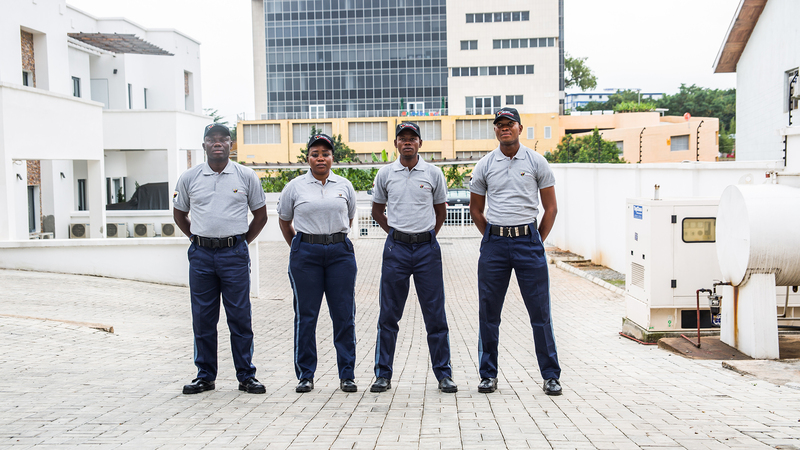 These guards are responsible for the safety of lives and property as it concerns our clients (Residents and Offices). They patrol the area, detect and report on suspicious criminal activities. They have good communication/writing skills and have received standard security training. These are usually static guards that monitor activities. Their primary role is to provide effective access control. They must have a basic education, basic security training, guarantor’s verification and good communication skills. As a homeowner and resident of Savanna Etsate I want to commend you on the high level of service being provided to our Home Owners Association. The professionalism of your officers is exceptional.